"When the term "all around" athlete is used at the University of Miami, only one name can come to mind: "Whitey" Campbell. As a UM undergraduate, Campbell lettered in three sports: football, basketball , and baseball. During his four years at Miami, he earned 12, more than any other athlete. In basketball, Campbell became the first UM cager to score more than 1,000 points in a career. As if his football and basketball feats weren't enough, Campbell went on to master baseball at Miami. 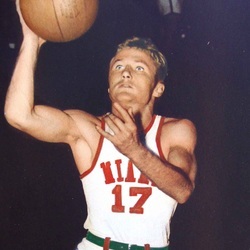 He returned to Miami for five years (1957-1961). At one time or another Campbell was variously: (1) head freshmen coach, (2) assistant varsity coach, (3) baseball coach. In returning to Miami as an assistant football coach in 1971, Campbell was voted into UM's Sports Hall of Fame in addition to being voted the Outstanding Athlete for the first 25 years of athletics at Miami." While officially inducted into the UM Sports Hall of Fame for basketball, Whitey was a four year letter winner in THREE sports, football, basketball and baseball, the most by any Hurricanes athlete in school history, Whitey was voted the "Outstanding Athlete" of the first 25 years of the University. He served as UM's head baseball coach in 1958, 1960-1962 and compiled a record of 69-36-3. Whitey Campbell passed away on November 3, 2015 in Rutherfordton, N.C.